Tonight I went on one of those cyber journeys to discover some new blogging friends. A blogger whose posts are always thought provoking is Rebecca. Check out her Rebecca Writes site! While visiting Rebecca I came across another blog entitled The Upward Call. 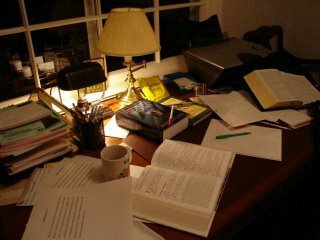 Scrolling down, I came across this picture of a desk with books, Bible, lamp and other "good clutter" on it. As far as I'm concerned there's nothing much better than a great "deskscape". So much of my work as a pastor, chaplain, writer, encourager, letter-writer and sometimes hermit, is done at a desk. My desk at home is a mess but I accomplish a lot down there. Actually I have four desks in one room in our basement. It's my hideaway. When Carol comes down to find me I can be buried behind 1,000's of books. My desk at my office in Peterborough, on the other hand, is always neat and tidy. The bookshelves are neatly arranged and I'm always ready to welcome a friendly guest. Desks intrigue me. Show me someone's desk and I'll tell you something about that person's character. In the same vein, let me browse through someone's library and it will give me very telling clues as to where that person is at in his or her spiritual journey with the Lord. Got any good pictures of desks, offices, libraries, etc? This weird guy would like to see them.